What Else can I Expect from an Online Bachelor's in Forensic Science and Crime Scene Investigation Program? What Can I Do With a Bachelor's in Forensic Science and Crime Scene Investigation Degree? An online bachelor's in forensic science and crime scene investigation prepares you for a career as a front-line investigator or a forensic laboratory technician. You'll learn skills in bloodstain pattern analysis, crime scene reconstruction, and fingerprint analysis. The nature of crime scene investigation has undergone rapid changes in the 21st century. The criminal justice system no longer relies solely on eyewitness testimonies to solve crimes. Emerging technologies allow investigators to examine the tiniest clues and track movements of suspects. The projected growth rate for this career is 27% by 2024, with average earnings of more than $50,000 a year. This page provides you with an overview of the best online bachelor's in forensic science and crime scene investigation programs along with information about program curriculum and popular concentrations. WILL THIS PROGRAM PROVIDE ME WITH THE SKILLS I NEED TO ADVANCE MY CAREER? This program prepares you for a career in the fields of criminal investigation and forensic science. Programs provide detailed training in key areas, including investigative forensics, crime scene investigation, and medical and legal investigations of death. Students gain contemporary skills in fingerprint analysis and cyber crime. This degree allows for certification training in specialized forensic analyses and professional investigation. Specialized skills in areas such as firearms and toolmark analysis promote opportunities for career advancement. DO I NEED PREVIOUS WORK EXPERIENCE TO GET IN? Previous experience in law enforcement or criminal investigation is recommended, but it is not a prerequisite to earning your degree. Some programs allow work experience to count as earned credit, and previous work experience may accelerate the completion of your degree. For students without prior experience, a degree equips them with the knowledge and skills needed for entry-level positions. CAN I WORK WHILE I COMPLETE MY ONLINE BACHELOR'S IN FORENSIC SCIENCE? Students have the ability to pursue their online bachelor's in forensic science and crime scene investigation and work full-time. The flexible nature of online learning allows students to complete assignments at their convenience, whether that's on their lunch break or at the end of the day. Some degrees require students to enroll full-time. This usually means that students take at least two courses during the semester and dedicate thirty hours a week to their assignments. Based out of Albany, New York, Excelsior College earns national acclaim for its programs in business, health science, nursing, public service, and the liberal arts. The college also boasts deep roots in distance education, originally opening its doors in the 1970s as an external program. Excelsior combines its strength in public service with its experience in distance learning to offer an online forensic science bachelor's degree. Excelsior's program allows students to complete an optional concentration in homeland security. While the program currently awards a nominal degree in criminal justice, students may take significant elective coursework in investigative forensics. The program's major curriculum comprises 120 credits, including at least 33 criminal justice-related credits. Core courses include criminology, criminal justice administration, research methods in criminal justice, and introduction to law enforcement. Students also complete a capstone course that involves a significant research project. Most students graduate in four years of full-time study. As many of Excelsior's online students continue to work or raise a family full time while earning their degrees, the college delivers all program coursework asynchronously and without in-person or on-campus requirements. The program does not list any minimum GPA or standardized test requirements for applicants. Transfer applicants may submit their credits for approval on a case-by-case basis, and the college lists no maximum for undergraduate transfer credits. A public university based in Adelphi and a member of the University System of Maryland, UMUC primarily focuses on distance learning. As such, the university enrolls over 80,000 students around the world, earning the distinction of one of the world's largest online schools. UMUC offers online programs across a variety of disciplines, including an online forensic science degree. The online forensic science program at UMUC requires that students earn 120 credits before graduating. Most students complete the program in approximately four years of full-time study. The 120-credit curriculum includes a robust slate of forensic science-focused coursework, including options such as cybercrime and security, criminalistics, criminal procedure and evidence, fingerprint analysis, and firearms and toolmarks analysis. The curriculum prepares students for certifications like bloodstain pattern analyst, crime scene, and latent print. As an experienced school in online education with a large population of students who work or raise a family full time, UMUC aims for flexibility in its online programs by delivering coursework asynchronously and never requiring online students to visit campus for any reason. Moreover, transfer students may bring up to 90 approved credits with them when they join the program, allowing them to accelerate their progress toward their forensic science degree. The program also offers significant per-credit tuition discounts to military students, cutting the out-of-state cost in half. Based in Lynchburg, Virginia, the private, evangelical Christian-affiliated Liberty University earns a place among the largest Christian universities in the world. Liberty holds that distinction thanks to its enrollment of over 100,000 students worldwide (including 30,000 military students), most of whom enroll at the school due to distance learning. As such, in addition to topping the list of the largest Christian universities, Liberty holds a spot among the world's largest online colleges. Liberty's slate of online programs includes one of the nation's only online forensic science degree programs. Nominally awarding a bachelor of science in criminal justice with a focus in crime scene investigation, Liberty's program requires students to complete 120 credits before graduating, a process that typically takes around 42 months. That 120-credit curriculum includes courses like juvenile justice, corrections, crime scene photography, crime scene management, and computer and cyber forensics. The program delivers all coursework asynchronously and eliminates in-person, on-campus, and capstone/thesis requirements. Each online course lasts for eight weeks. Students who transfer into the program may bring up to 90 approved credits with them. The program does not list any admission requirements other than a minimum 2.0 cumulative GPA. Consequently, applicants do not need to submit SAT or ACT scores to earn admission. All military students who enroll in the program receive a discounted per-credit tuition rate. Columbia College is a private, liberal arts-focused women's college based in the state capital and eponymous city of Columbia, South Carolina. Originally opening its doors in the 1850s, Columbia established an evening college in the 1980s with the goal of educating both men and women. That evening college eventually evolved into distance learning programs, which enroll both men and women. Columbia's slate of distance learning programs now boasts one of the nation's strongest forensic degrees online accredited by the Southern Association of Colleges and Schools Commission on Colleges. The forensic science program at Columbia nominally awards a bachelor of arts in criminal justice with a forensic track. The program's curriculum typically takes the standard four years to complete and includes relevant coursework in forensic toxicology, fingerprint recognition and comparison, and forensic DNA. The program's core forensic science class also includes a lab requirement. The curriculum meets standards laid out by the FBI Technical Manual and the South Carolina Criminal Justice Academy. Upon graduating, students can work for federal agencies like the FBI or CIA, local agencies as detectives or forensic investigators, or in the private sector. Catering to the many working professionals who enroll in the program, Columbia delivers all program coursework asynchronously and never requires students to visit campus. As a private college, Columbia does not distinguish between out-of-state online students and South Carolina residents when charging tuition. A private, historically black university operating out of the titular city of Hampton, Virginia, HU originally opened its doors thanks to the efforts of the American Missionary Association, an 1860s abolitionist group. Originally focusing on educating Native Americans and future teachers, HU greatly expanded its disciplinary offerings over the years and currently boasts programs in a variety of fields. In the 21st century, the school began offering several of its programs online and now excels in distance learning. HU's slate of distance learning programs includes a forensic science degree online. HU's forensic science program nominally awards a bachelor of science in chemistry with a concentration in forensic chemistry. As such, the program's 126-credit curriculum combines upper-level chemistry coursework with field-specific studies like forensic chemistry and physical methods in forensic chemistry. Students also complete relevant coursework in fields such as calculus and physics, which typically include lab components. Most students finish the program in the standard four years of full-time study. The program boasts accreditation from the American Chemical Society. Mirroring many of its peers, HU delivers all online coursework asynchronously and does not require students to visit campus. As a private university, HU charges all students in the program the same base tuition rate no matter where they live. The program and the science department do not list any minimum GPA or standardized test admission requirements. Ready to earn your online degree in crime scene investigation? The following information provides an overview of what you can expect from an online program in the field. While details may vary from program to program, most degrees offer similar curricula and career opportunities. It's common for online degrees in forensic science to offer the following courses as part of their curriculum. Core requirements generally cover these topics, which teach valuable investigative and analytical skills. Crime Scene Investigation: This course familiarizes students with the steps of crime scene examination, including documenting the scene and gathering evidence. Students gain entry-level investigation skills and learn how to interview witnesses and interrogate suspects. This course prepares students for careers as detectives, investigators, and police officers. Firearms Analysis: This class focuses on the analysis of firearm toolmarks found at crime scenes. Students are familiarized with the mechanics of firearms and learn how to use various methods to analyze and compare toolmarks. Legal aspects of firearms analysis are explored. Forensic technicians use these skills when examining evidence. Medicolegal Death Investigation: This course explores cause of death from medical and legal perspectives. Students learn how to use forensic science techniques to determine cause of death and establish an identity of the deceased. Students gain skills in notifying next of kin, writing reports, and examining crime scene photography. Lab technicians and criminal investigators rely on these skills. HOW LONG DOES IT TAKE TO GET AN ONLINE BACHELOR'S IN FORENSIC SCIENCE? An online bachelor's in forensic science and crime scene investigation takes approximately four years for full-time students to complete. The average program length is 120 credits, and students can usually transfer 60-90 general education credits toward their degree. While online crime scene investigation programs generally emphasize similar training, curriculum requirements may impact the length of time required to earn the degree. Capstone projects, internships, and elective requirements all affect the length of an online program. Students begin coursework as soon as they are admitted to a program or wait to begin the program with their cohort. Individually-paced programs often admit students on a rolling basis and emphasize independent learning. Cohort learning models promote academic communities, and students engage with peers to complete assignments. The cohort format also follows a set pace, usually requiring more time to complete. 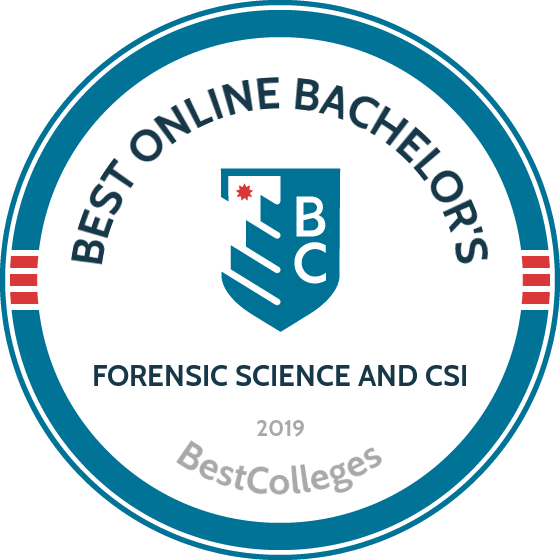 The best online bachelor's in forensic science and crime scene investigation programs are regionally or nationally accredited. Accrediting organizations ensure that schools adhere to national standards for higher education training programs. The biggest difference between regional and national accrediting bodies is the type of school they accredit. Regionally accredited schools are non-profit, degree-granting institutions, while nationally accredited schools are usually vocational or trade schools. Regionally accredited universities sometimes do not accept credits earned at nationally accredited schools. Online programs are included in accredited schools' academic standards, and students should look for online programs that are regionally or nationally accredited. The Distance Education Accrediting Commision (DEAC) specializes in accrediting online programs. It conducts team visits and requires distance learning programs to prepare self-evaluation reports. FEPAC is a field-specific accreditation program that provides quality control for forensic science education programs. Accrediting bodies are recognized by the Department of Education (DOE) and/or the Council for Higher Education Accreditation (CHEA). DOE oversees the accreditation standards for recognized accrediting bodies and ensures that academic integrity is upheld. CHEA requires institutions to demonstrate academic quality and accountability. Public access to databases of accredited schools and programs recognized by DOE and CHEA are available, and students are encouraged to review them. An online degree in crime scene investigation prepares students for a variety of career paths, including crime scene investigation in a laboratory setting and law enforcement. The following occupations are commonly pursued by graduates. Laboratory technicians have a knowledge of biological science and possess skills in critical thinking, observation, and analysis. They keep regular hours, unlike police officers and private detectives who work in shifts or whenever surveillance is required. Forensic science technicians collect and analyze evidence from crime scenes. Crime scene analysis tasks include taking photos, making sketches, recording observations, and preserving evidence. Laboratory duties include performing microscopic and chemical analyses, reconstructing crime scenes, and examining digital media. Private detectives work for individuals, attorneys, and large companies. They perform background checks and investigate employees. They gather information through interviews, surveillance, and public records. Police officers protect communities by enforcing laws, responding to emergency calls, patrolling areas, and monitoring activities of suspects. Police officers apprehend lawbreakers, write reports, and testify in courts. They may work in specific areas, such as narcotics or canine units. Lab technicians aid in criminal investigations by analyzing bodily fluids, tissue, and other substances found at crime scenes. They use microscopes, cell counters, and computerized instruments to determine blood type. Biological technicians often work on teams to conduct biological tests. They use microscopes, robotics, and automated equipment to perform experiments and analyze microbes. Numerous opportunities for advanced training in the field of forensic science exist. Students pursue graduate degrees to refine skills in specific areas such as digital imaging processes or crime scene photography, or they move from roles in law enforcement to careers as technicians. An advanced degree increases salary potential. According to data from Payscale, a general biological science technician has an average salary range of $31,000-$42,000, while a forensic analyst with specialized skills earns $60,484 annually. MS in Forensic Science: This degree takes approximately two years to complete and usually consists of 30-36 credits. Students often have the opportunity to concentrate in a specific area of forensic science, such as forensic chemistry or forensic investigation. MS in Crime Scene Investigation: This graduate program is typically 36 credits and emphasizes advanced training in forensic pathology, science of fingerprints, and bloodstain pattern analysis. The program familiarizes students with criminal laws that are pertinent to the field. MS in Forensic Medicine: Completed in 12-18 months, this degree prepares students for careers as medical examiners. Coursework covers topics in forensic autopsy, toxicology, radiology, and scientific evidence. Students learn how to conduct scholarly research and write for academic audiences. Crime scene investigation and forensic science professionals rely on cutting-edge skills that must be continually updated. As they gain professional experience, their skillsets expand along with potential earnings. Data from PayScale demonstrate that average salaries increase with time spent on the job, and the following table highlights salary changes from career entry to later stages. Online degrees in forensic science prepare graduates for entry-level careers, but additional certification is an excellent way to enhance job opportunities and boost earnings. A professional certificate provides evidence of specialized skills and ensures employers that the latest techniques are used. The following certification programs prepare forensic scientists for careers in digital forensic analysis, investigation, and various crime scene analyses such as DNA, fire debris, and trace evidence. Most professional certificates must be renewed every 3-5 years. Forensic Analyst Certification: This certificate training program is offered by GIAC and equips professionals with skills in data extraction from Windows and Linux computer systems. To become a certified forensic analyst, you must complete a 115-item proctored exam that covers topics in incident investigations and digital forensic cases. Forensic Technician Certification: The American Board of Criminalistics offers several certificate programs that allow forensic technicians to specialize in an area of forensic science. Areas of testing range from drug analysis to firearms and toolmarks. Examinations consist of 220 questions and take three hours to complete. Professional Investigator Certification: A professional certified investigator (PCI) demonstrates skills in evidence collection, case management, and preparation of testimonies. Eligibility includes five years of investigative experience, including two years of case management. The PCI exam is 125 multiple-choice questions that test knowledge in investigative techniques and procedures. Professional organizations provide students and recent graduates with valuable resources that assist them academically and professionally. Members of professional forensic science organizations, such as the ones listed below, have access to mentors, scholarly research, and job boards. Annual conferences familiarize students with the latest topics in the field and provide networking opportunities. Career resources connect students with organizations with similar professional interests, including forensic anthropology, odontology, and toxicology. American Academy of Forensic Sciences (AAFS): AAFS is an interdisciplinary organization that promotes improved practice and educational competency in the field of forensic science. Student opportunities include career resources, CSI summer camps, and the Young Forensic Scientist Forum, a program dedicated to emerging forensic scientists. American Board of Criminalistics (ABC): ABC is comprised of representatives from regional and national forensic science organizations. ABC offers numerous certification programs and proficiency tests. International Crime Scene Investigators Association (ICSIA): ICSIA is an organization for law enforcement professionals who process crime scenes. ICSIA promotes ethical conduct and the exchange of information. Numerous financial aid options exist to help make your online bachelor's in forensic science and crime scene investigation affordable. Federal student aid provides financial assistance programs, including loans, grants, and work-study funds. Submit a FASFA to determine your federal assistance eligibility. Other forms of financial assistance include scholarships, program discounts, and grants. Many private scholarships are affiliated with universities, including forensic science scholarships and grants for students interested in conducting research. Approximately two-thirds of today's college students rely on loans to fund their education, but there are plenty of overlooked financing options you can use to reduce your overall student debt. Completing the Free Application for Federal Student Aid (FAFSA) is a crucial first step for any student with financial needs. Our FAFSA guide features a step-by-step rundown on the process and answers several frequently asked questions. Financial aid for online learning is equivalent to what you'll find for campus-based learning, but that hasn't always been the case. Learn about the changes that have taken place, as well as the different funding opportunities available to online students. Online college programs can be a flexible, affordable option for single parents who are interested in earning a degree and securing their family's financial future. We've compiled a list of scholarships, grants, and other financial aid options geared toward single moms and dads. Millions of dollars in free money is available to U.S. military personnel, but much of it goes unused. Learn more about grants, scholarships, and other financial aid opportunities available to veterans, active-duty service members, and reservists. At BestColleges, we recognize that there is no “perfect” ranking methodology; rather, we aggregate what we believe are the most relevant school indicators to provide you with rankings that are useful. We hope our approach helps you find the school that's best for you. The methodology behind our rankings is grounded in statistical data and a few consistently applied guiding principles, including academic quality, affordability, and online competency. Our 2019 rankings reflect the most recent data available from the Integrated Postsecondary Education Data System (IPEDS) and College Navigator, both of which are hosted by the National Center for Education Statistics. Additionally, for our 2019 online bachelor’s degree rankings we compiled responses from a survey circulated to institutions in Summer, 2018. 90 participating schools responded to institutional and program-level questions regarding the online bachelor’s programs offered during the 2017-2018 academic school year. We incorporated six additional ranking factors from this survey into the following relevant ranking methodologies. Our goal is to objectively assess relative quality based on academic outcomes, affordability, and the breadth and depth of online learning opportunities. To assess academic quality, we focus on what we believe are the most important distinguishing factors. We compare a school’s admission rate to their enrollment rate to gauge the rigor and competitiveness of a school. We use retention rate (or, the rate at which students return after their freshman year) to rank a school’s effectiveness at keeping students enrolled. Similarly, graduation rate is crucial in weighing how many enrolled students successfully complete their degree program (note that graduation rate measures full-time, first-time students). Affordability considers the cost of the program (average net price) with the amount borrowed and owed after graduation. Our goal is to reward schools not only offering competitive tuition but also providing students with the skills needed to graduate and successfully enter the workforce. Finally, we assess the quality of a school’s online offerings by looking at who is teaching online classes, the length of time the school has been investing in online learning, and the degree to which students are supported as distance learners. We also consider the percent of students enrolled in online classes as an indicator of school investment. All eligible institutions are ranked on a 100 point scale. A perfect score of 100 is earned by ranking #1 within each of the three ranking categories. Unless otherwise noted below, we applied our 15 ranking factors to the 2,028 eligible schools currently offering online programs. To collect data for our 2019 rankings, we pulled the most current, publicly available datasets from the National Center for Education Statistics in October, 2018. Data was QA’d by our internal team with attempts made to fill any missing or erroneous data points by referencing school websites when applicable. Schools missing a substantial number of ranking factors or with unreported data were omitted from our rankings list. Additionally, proprietary surveys were sent to schools offering online bachelor's degrees in Summer, 2018, and collected in September. We’ve done our best to ensure than any school information included is recent and accurate. We know data is complex and acknowledge that we may not always get it right; if you spot missing or outdated information on our site, please contact us at data@bestcolleges.com so we can address it. Each school must be an accredited public or private, not-for-profit institution. Accredited Online Bachelor's Degree Programs: Each school must offer at least 10 online bachelor's degree programs and three online master's degree programs. Accredited Online Associate Degree Programs: Each school must offer at least six online associate degree programs. Must submit an annual report to the National Center for Education Statistics. Each school must offer at least one online bachelor's degree program.